We do our best to make sure our products are perfectly priced; however, if you think you've found it cheaper somewhere else, we'll happily try to beat it. In stock and ready for immediate delivery on competitor's site. 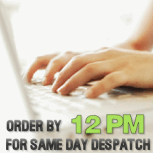 When we price match we include any delivery charges applied by the competitor. So, the price of their product plus the same standard of delivery must be cheaper than our product. This offer is only valid on the day you make your claim, so make sure you don't miss out. Excludes used, ex-display and ex-demonstration goods. Just so you know, we don't price match against auctions sites. If you've found your product cheaper somewhere else and it matches the criteria above, all you need to do now is fill out the form below and we'll do the rest.